MOSCOW, Idaho – If Idaho plays two quarterbacks against Montana State, it will be by necessity not choice. Through five games, the Vandals have alternated between junior Mason Petrino and sophomore Colton Richardson – sometimes play-to-play. But Richardson, who suffered a head injury in the Vandals’ 62-28 loss to Idaho State, is in the concussion protocol and won’t play against the Bobcats. Freshman Nikhil Nayar got Richardson’s practice reps, primarily with the second-team offense, this week. Nayar hasn’t played and will likely only see action if Petrino is injured. In four games, Richardson has completed 27 of 49 passes for 407 yards with five touchdowns and four interceptions. In five games, Petrino has hit on 73 of 121 attempts for 776 yards, with five touchdowns and four interceptions. The Vandals and Bobcats could benefit mightily from a win to jump-start Big Sky Conference seasons that have not yet measured up to preseason hopes. The 3-2 Bobcats, coming off a bye, are 1-1 in the Big Sky. Like Idaho, they beat Portland State. In their last game, they dropped a 34-17 decision to Eastern Washington. The Vandals (2-3) are a game down to MSU in the league at 1-2. Weather might be a factor in Bozeman. The high is predicted to be 34 degrees, and snow is forecast. Snow brings the Vandals good luck, according to coach Paul Petrino. He pointed to their 61-50 Famous Idaho Potato Bowl victory over Colorado State in 2016. “The last time we played in snow was a pretty good game, the bowl game,” Petrino said. In their opening game that season, the Vandals held off Montana State 20-17 in Moscow in what was then a nonleague contest, since Idaho was still playing in the Sun Belt Conference. The Bobcats played about a dozen freshmen. Those players are now upperclassmen and veterans. The difference, however, may be a sophomore, quarterback Troy Andersen. An in-state product from Dillon, he is athletic enough to play linebacker and running back as well as stepping in at quarterback when the position opened up because of an injury. “He’s a big, physical, tough competitor,” Petrino said. Andersen has rushed for 517 yards this season, including 94 against EWU. He has thrown for 344 yards and a touchdown, including completing 12 of 19 passes for 156 yards against the Eagles. In addition, he got in on a few plays at linebacker. 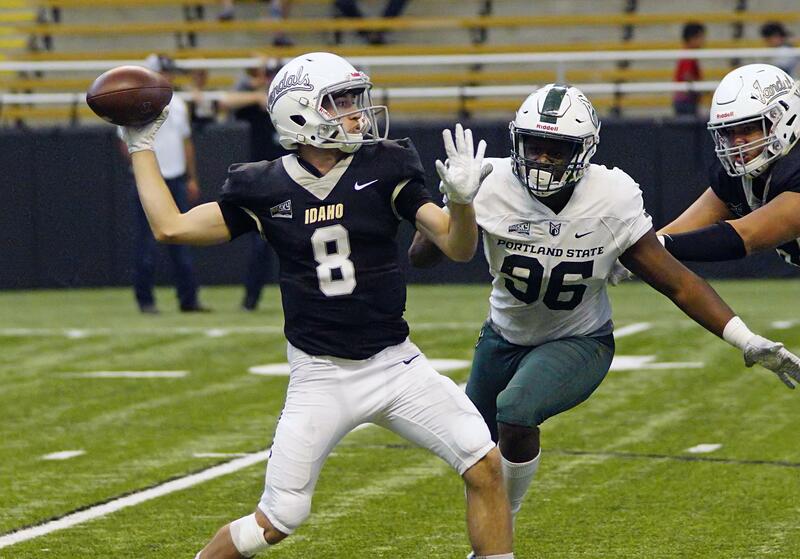 The Vandals are looking to rebound from a shocking defensive performance against Idaho State. The Bengals set a single-game record with eight passing touchdowns. Petrino was most dismayed the Vandals were giving up scores to the side of the field where they had the advantage of more defenders. “That stuff shouldn’t happen,” he said. The game was the third time Idaho’s defense has been exposed. Fresno State scored 79 points against the Vandals and UC Davis 44. Petrino said there may be lineup changes against the Bobcats. He acknowledged, though, these won’t be wholesale. “You can’t give up on everybody,” Petrino said. For all its troubles against the Bengals, Idaho still managed to stay within 13 points through much of the third quarter. The offense took a step forward. “Unfortunately, it should have been even better,” Petrino said. The offense converted 9 of 18 third downs. Twice, Idaho was one block away from taking a kickoff back for a touchdown. Senior running back Isaiah Saunders is powering Idaho’s offense. He is giving 2,000 career rushing yards a hard look. He has 1,728 and ran for 144 yards a week ago. Published: Oct. 12, 2018, 5:38 p.m.